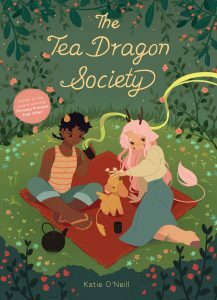 The Tea Dragon Society (Oni Press) and Jen Wang’s The Prince and the Dressmaker (First Second). To celebrate these wonderful graphic novels, the CBC Graphic Committee invited each winning creator to ask the other “3 Questions”. This Creator Feature is the second of two. Wang: What has been your biggest motivation for pursuing comics as a form of self expression? O’Neill: A big part of it has been their accessibility- both for creators and readers. I got my start with webcomics, and it was so fulfilling to be able to share my work worldwide, and know that readers across the globe can access the comics easily and freely. There was no obstacle to getting started, and so I started- which can be one of the more difficult steps for a young creative. Wang: What part of the creative process do you find the most challenging right now and what are you doing to work through it? O’Neill: Recently, I’ve been struggling with taking rest- a lesson hard learned by skirting very close to a burn-out. However, the experience showed me that downtime is really an essential part of the creative process, just as important as any other. I’ve been learning to see it as hibernation time, and time to learn new things about myself and the kind of work I want to make in future. Wang: If you had all the support and backing in the world to produce a dream project, what would it be? O’Neill: If I had the resources, it would be such a joy to start an artist residency here in New Zealand! I think it’s the perfect place for it, with inspiring landscapes, a relaxed pace of life and relative isolation. A self-sustainable community for artists would be ideal. Having time and calm to focus on work is so important, and it would be lovely to create space particularly for those who are underrepresented in the industry, or who face hardships in their everyday life. Katie O’Neill is an illustrator and graphic novelist from New Zealand. Author of Princess Princess Ever After, The Tea Dragon Society, and the newly-released Aquicorn Cove, she has received Eisner, Harvey and Dwayne McDuffie awards for her graphic novels for children. 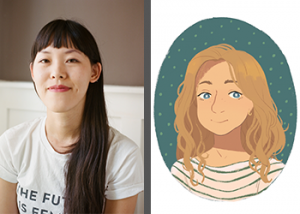 She mostly makes gentle fantasy stories for younger readers, and is very interested in tea, creatures, things that grow, and the magic of everyday life.